Seventeen year old Jessie and her best friend Bear, the pit bull, hit the road to discover fame — and her father — in this hugely entertaining and perceptive YA debut about music, murder and everyday magic. 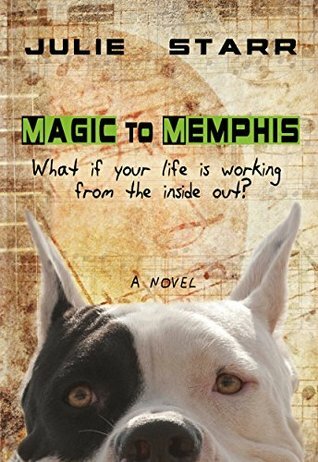 life smolders, and with nothing left to loose, Jessie determines to follow in her father’s footsteps, and along with Bear, embarks upon a coming-of-age journey to Memphis, with unexpected results. Unknown to Jessie she is being followed by a violent sorcerer, Kabos, who will stop at nothing to retrieve an Egyptian ring that Jessie’s Dad stole many years ago and which is now hidden in his box of belongings. Suddenly, a simple music contest turns into a fight for survival. Only a puzzling traveler called Finch has the answers Jessie needs. But will she listen? And can she trust in herself enough to change her luck and make real magic happen? Inspired by her own travels to Memphis, USA, author Julie Starr has artfully drawn upon her own experiences of walking the city streets, engaging with the rich social scene and unique musical culture to create an authentic and vividly detailed backdrop to Jessie’s journey. Empowering and supporting young women is Julie’s raison d’être, with royalties from Magic to Memphis, and her other publications, being donated to charities in India that support and educate street children, including Children of Mother Earth, Ramana’s Garden and Food for Life Vrindavan. Through her protagonist, Julie builds on her professional coaching expertise in order to subtly highlight to young readers not only that their destiny is their own responsibility but that their actions and emotions can impact on and reflect their outside world. A thrilling and insightful story of friendship and self-discovery Magic to Memphis will captivate fans of Phillip Pullman’s Dark Materials Trilogy and is set to fascinate, enlighten and move young readers to reflect upon their own actions and gain the courage to live in the moment.